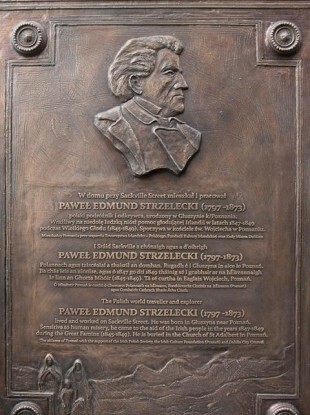 A PLAQUE HAS been erected in Dublin to commemorate Polish explorer, scientist and philanthropist Paweł Edmund Strzelecki. Lord Mayor of Dublin Christy Burke and Mayor of Poznań Jacek Jaśkowiak unveiled the plaque at a ceremony in Sackville Place yesterday. Tánaiste Joan Burton was also present. She said she is “greatly struck by the ideals of solidarity and human compassion Paweł Edmund Strzelecki’s life and work represent”. “I can think of few better representatives of the positive influence of the Polish people in Ireland. So let’s honour him and cherish his memory. Just as we should cherish the hundreds of thousands of contributions our Polish community has made to the modern, inclusive Ireland we’re building today. I hope to see our two nations grow even closer in the years ahead. Strzelecki, a British subject, was appointed a famine relief agent in Ireland in 1847. He helped to raise funds for those most in need. He lived and worked on Sackville Place. Jaśkowiak said Strzelecki was “a magnificent man who created bonds and built bridges between nations”. Burke said it was a “great pleasure” for him to unveil the plaque as Strzelecki “did so much for the Irish people during one of the darkest periods of our history”. The plaque is funded by the people of Poznań and the Poznań Irish Culture Foundation, and erected with the support of the Irish Polish Society, Dublin City Council, the Polish Embassy and Clerys department store. The unveiling was part of the PolskaÉire festival which celebrates the diversity the Polish community has brought to Ireland. Opinion: Are we being overly sensitive about C4′s Famine sitcom? Email “Ever heard of the Pole who helped Famine victims? He's been honoured in Dublin”. Feedback on “Ever heard of the Pole who helped Famine victims? He's been honoured in Dublin”.